The artistic path has been a core part of my life. Born into a film family, and being remarkably hopeless at subjects like physics and chemistry at school I guess it was always going to be so…. I believe Art in all its forms is one of the most essential expressions of humanity – a vehicle for heart, soul and spirit to become embodied and transmitted directly. Art has the power to completely transport us, to penetrate us, to touch our hearts, to shake and awaken us, to take us behind the surface layers of life into the forces that shape our reality. To see a musician in full, egoless flow is at best to be in the presence of the creative energy of life itself. In a second-hand bookshop during my gap year before university, I stumbled upon “Towards a Poor Theatre” the book that changed everything, that awoke me to what theatre could be. Jerzy Grotowski was revered worldwide as the successor to Stanislavsky, yet he was less known or respected in the UK where his visceral and intensely emotional approach bumped against the great British theatre tradition. I knew this would be my path for many years. Studying Drama at Bristol University gave me a great three years of study and exploration, and the first attempts to live into Grotowksi’s vision. As soon as I finished at Bristol I obtained a British Council grant to go to Grotowski’s Teatr Laboratorium in Wroclaw, Poland. It was still the Communist era. Until now I accepted with reserve the terms such as “secular holiness”, “act of humility”, “purification” which Grotowski uses. Today I admit that they can be applied perfectly. A sort of psychic illumination emanates from the actor. I cannot find any other definition. In the culminating moments of the role, everything that is technique is as though illuminated from within, light, literally imponderable. At any moment the actor will levitate….he is in a state of grace. 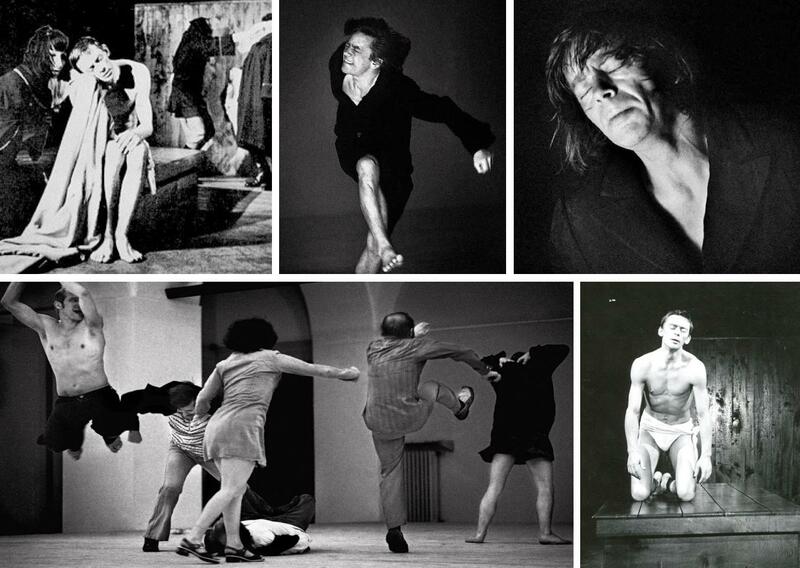 Grotowski had by this time shocked the theatre world by announcing he was finished with performances and was conducting wild, radical, post-theatre research into consciousness. We pushed the extremes of physical activity for days and nights with hardly any sleep, often out in nature, to generate intense ‘altered state’ experiences of openness and connectedness. Once, we were taken out to an an abandoned stable in a forest. It was freezing cold February winter. For five days we walked and ran as a ‘pack’ through the forest – we were not allowed to talk or wear coats or gloves, and whenever we went to sleep (in all our clothes huddled in sleeping bags) we were woken after two hours to go out again. Round the clock. At the beginning the Polish leader told us very simply that this would be very hard, that we were welcome to leave if we could not take it, and that he would never speak to us again if we did…In amidst the extreme cold, discomfort and fatigue there were many unforgettable experiences, still remembered forty years later. And the work was another step of awakening to the possibilities of perception beyond what we think of as ‘normal’, and to the body as a key gateway. I subsequently brought this work to the UK, and those who were ready for its intensity, its call to a fully embodied authenticity, felt really inspired. I created a company, The Performance Research Project, and as in Switzerland, we worked for at least nine months on each production. I gave many workshops around the UK, and in the US, and also taught at leading drama schools, including The Royal Academy of Dramatic Art in London. I felt excited and honoured to bring such ‘experimental’ work into the heart of the British theatre establishment. Sitting for hundreds of hours in the rehearsal room or the classroom, watching and helping actors bring themselves into more and more embodied openness became a way of life, an effort that was rewarded many times over. What came through the actors was often truly awesome, occasionally touching on the miraculous. With some regularity we had the sense of being in a Temple, bathed in a sacred energy. If I had the opportunity to have a second, parallel life it would without doubt be as a musician. I love music of all types and cultures. As a teenager I studied classical piano. My teacher told me that if I had started as a child I could have been a concert pianist. I have always loved the rigour of daily practice, the slow path of technical improvement. This was a fascinating, often challenging immersion in a different culture. I lived with Adama and his family in very basic conditions. He taught me every day, and after one month I became able to be his accompanist at marriage and baptism ceremonies. We were usually the only men amongst up to 100 women. We provided the fuel for their singing and ecstatic dancing. My hands were often cut to shreds, the women cried for me, and I learnt the very challenging discipline of being a metronome, an anchor for Adama, so he could fly. If I varied by the tiniest fraction of a second he immediately turned and glared at me. Even among African drummers he was one of the very best. Afterwards he came to Switzerland again and we gave concerts on stages and in the streets. My dancer partner and I subsequently gave workshops and demonstrations based on what we leant in Africa, and I also taught djembe drumming and made an instructional video. 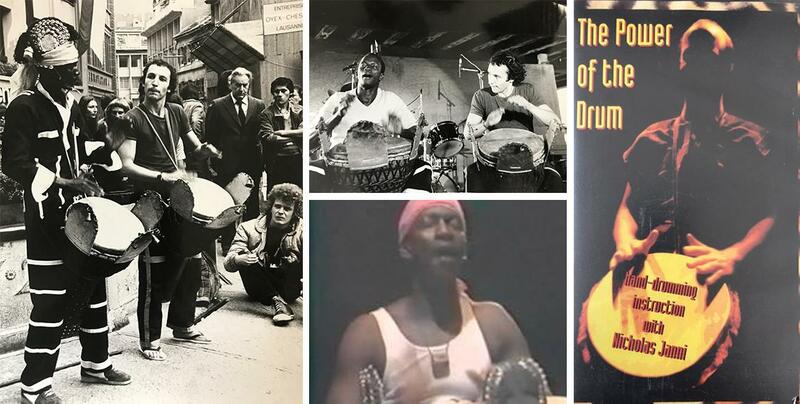 The jembe drum became a core part of my life, and, as well as performing, I used it to great effect on many occasions in workshops, sometimes with groups of 100-200 people. The vibration and sound of the jembe enters deep into our body, and can be a powerful catalyst for the release of blocked energy. The incredible Kodo drummers accepted me as a student for three months in 1985 at their base on Sado Island, Japan, an island that has an interesting history of artists in exile, including the founders of Noh Theatre. Kodo lived a highly disciplined, rigorous lifestyle, completely devoted to their drumming. The physical challenges go the drumming were huge and it was only after two months of varying degrees of pain that my body adjusted. More energy flowed from my hara (body centre) and I became able to play for long periods of time, and really enjoy the precision, togetherness and sonic meditation we achieved together while playing. Back in the UK I met master-drummer Joji Hirota. We formed a wonderful percussion trio with Nigerian drummer Sola Akingbola, called ‘Ubiquity’. Sola has for some time now been the percussionist for Jamiroquai. I also played many times is concert throughout UK and Europe as accompanist to Joji. In both scenarios I was far behind their ability, yet managed to be the anchor they needed. In recent years I listened more often to the Arabic instrument called Oud. I felt it to have a quite unique quality, to the point where I had a strong impulse to try to learn it. Since I had basic guitar skills I thought it could not be that difficult…how wrong I was! Unable to find a teacher in the UK I started to learn through recorded lessons online. Until one day I was looking again, and my teacher appeared. I have been studying for nearly a year now with Ramy Adly, an Egyptian master based in Washington DC. We work by Skype, often twice a week, and I try not to let more than one or two days go by without practicing. Ramy is not only a master musician, he is bathed in the spiritual aspect of the instrument and its original connection to healing. I’m on a fascinating journey with this instrument. It requires all my will and commitment to keep facing the technical challenges, but whenever Ramy starts to improvise for a few minutes in our lessons, and I feel what an exalted state he is in and how the Oud transmits this, I connect again to my determination to persevere. Deep down, theatre and the memory of the rehearsal room was always there. My wife always told me I would go back to it, but I didn’t really see this, until I met dance and movement master Gary Joplin. We shared an interest in creativity and performance as a spiritual path, and I had a strong sense we could create something together. Starting in a bare rehearsal room, with just a few seed ideas, and once agin stepping back into the unknowing and high frequency receptivity of creative work, refined in each of us over many decades, a piece gradually formed itself. 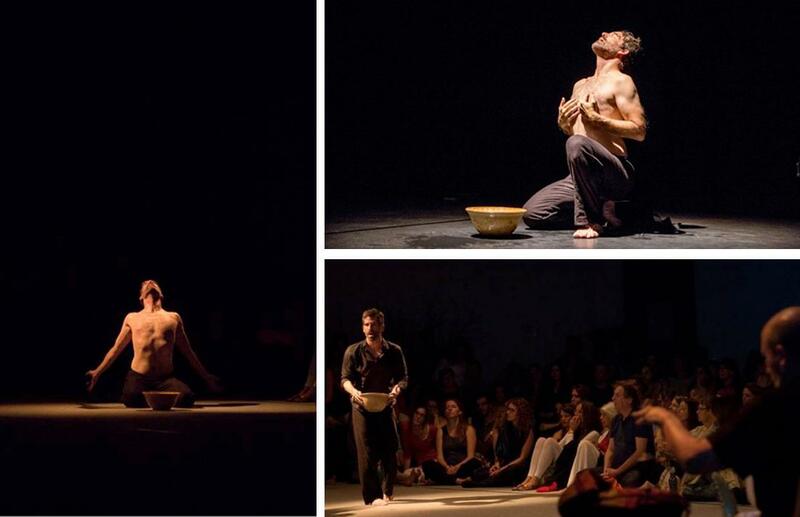 We called it ‘Ritual’ and consider it as existing at the interface of theatre, dance and ritual. We have performed and given workshops in Germany, Switzerland and the UK, and recently started working on a new piece, with no particular timetable in mind. It is a true joy to work together with such a shared interest and commitment to the path.